We revisit the wedding that never happened, seeing how things would play out if that day had gone differently. Of course, something feels off despite the marital bliss, with Constantine providing a doom and gloom prophecy throughout. What if the wedding of The Bat and The Cat had turned out differently? Batman #63 seems to give Bruce Wayne his happily ever after, with Batman and Catwoman now married and serving as Gotham’s top crime fighting duo. Things are not as they appear, though, if John Constantine’s presence is any indication. John dogs Batman throughout the issue, warning of personal tragedy just around the corner. Batman #63 presents part three of King’s Knightmares story arc. The dreamlike mood and uncertainty about reality that defined our last few issues are still here, but we start to get some answers by this issue’s end. King reveals information in a creeping, deliberate manner, serving to heighten the tension. We see Bruce and Selina enjoy their time as newlyweds. In every scene, though, Constantine reminds Bruce that things won’t—and possibly even can’t—go well for him. He turns up, constantly tugging at the threads of Bruce’s world…or at least what Bruce believes is his world. The last several issues remained largely abstract, going for mood and suggestion before revealing the twist at the end, and this one continues that trend. But, unlike our last two issues (good though they may be on their own), Batman #63’s end carries some genuine momentum for the broader narrative. We finally get answers to what’s going on and how it ties into Bane’s larger plan to psychologically break Batman. Mikel Janin does a great job reflecting the tone of King’s writing. The lines are soft, giving the artwork a somewhat wistful, light vibe compared to other recent issues. 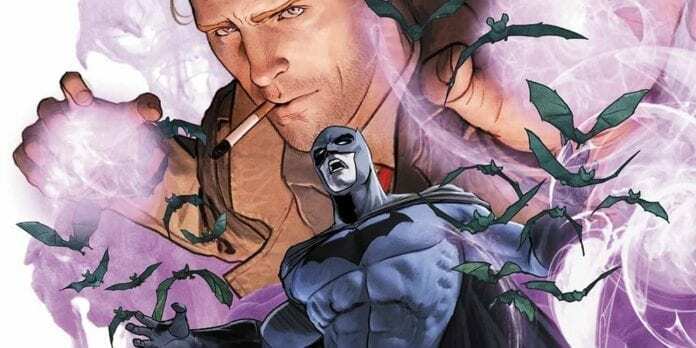 Batman #63 is light on action, instead focusing on Bruce’s interactions with Selina and Constantine. Janin keeps things interesting in the way he frames the panels, though. He divides some pages into similar, yet increasingly-zoomed-in images as the conversation rises in intensity, or shifts angles to keep things interesting. Jordie Bellaire provides a dynamic color sensibility, nicely complementing Janin’s line work throughout. She skillfully captures the tone for each scene, balancing between soft, slightly washed out palettes, and dark, yet vibrant tones. While the last few issues are great in their own ways, their lack of immediate connection to the overarching plot did start to drag the momentum a little bit. By the end of Batman #63, though, we finally have our narrative bearings.